AAVSO Alert Notice 608 announces an observing campaign on the cataclysmic variable TT Ari. Please see the notice for details and observing instructions. The VLA have scheduled the observations to run between 2-7.30 UT on December 10 and 11. The weather is looking good for then, but if it turns then we will reschedule to December 12. Any observations during that time will be really useful. For those of you who can take time-series observations (as high cadence as possible), we will really appreciate it. This is part of a worldwide campaign. There will be observations taken from the Very Large Array in New Mexico, the Palomar Observatory in California, the Boyden Observatory in South Africa, the Asiago Observatory in Italy, and from space-based observatories if the timing works out. Not all of these observations will be simultaneous with the VLA however, and we still need observations in multiple filters so that we can monitor every component of the cataclysmic variable. Your observations simultaneous with those of the VLA will be critical to monitor the different components, and your observations at other times will help cover the times in between our observatory runs. Thank you for all your observations. This will be a phenomenal dataset and will likely be able to answer many more science questions than we even have in mind for this project. Did you get both runs in already or is one scheduled for tonight 12-Dec UT? My weather looks promising for tonight and I wonder whether to do the high cadence or drop back a bit. Yes, please do take high cadence observations. There is a run scheduled for tonight. Weather looks good for me too for tonight (we had clouds in Scottsdale last night :( so no data for me). Considering the fact that there will probably be multiple other observers doing high cadence in V, would it be usefull if I where to use a different filter? Or should I stick to a Johnson V filter and go for redudancy? As the VLA observations are finished now, low cadence observations in a few filters will be the most useful for us now. Just uploaded time series data from last night on TT Ari. Over the next week, could you continue to do low-cadence monitoring of it please? This will show the longer term behaviour. In particular, I want to monitor for long term variability and possible state changes. I've compared the VLA observation times with the AAVSO light curve and you've all provided amazing coverage. Thank you so much! I have 4 hours of data from the evening of 10/11th. Unfortunately, my computer crashed as I was transferring the data from my observatory computer to a network hard drive. I’m hoping the data is still there when my computer is returned from repair. I hope that they fix your computer and that the data is recovered. Regardless of what happens, thank you so much for taking the observations. I was able to recover my TT Ari data from 12/10 and have submitted it. Yea!!! Hooray! That's great, Barbara. Thank you for those observations! Over the past month, I made 9 visual observations [ 1@10.7, 5@10.8, 3@10.9 ]. All brighter than 11.0, and looking at all visual observations over the past month, total of 31 are at 10.8 or 10.9, with just a few at 11.0, so it seems extremely unlikely from a statistical viewpoint, that the visual observations are biased by merely sampling at the high end of the brightness range. There is a real difference in the mean magnitude and the range between visual and CCD. The B-V is fairly "white" at +0.2 and V-R is about zero, so color is not really an issue with the visual observations, at least as far as the Purkinje effect. The CCD shows these 0.4 mag variations on an hourly cadence, yet I have never seen it as faint as 11.2 in recent times. 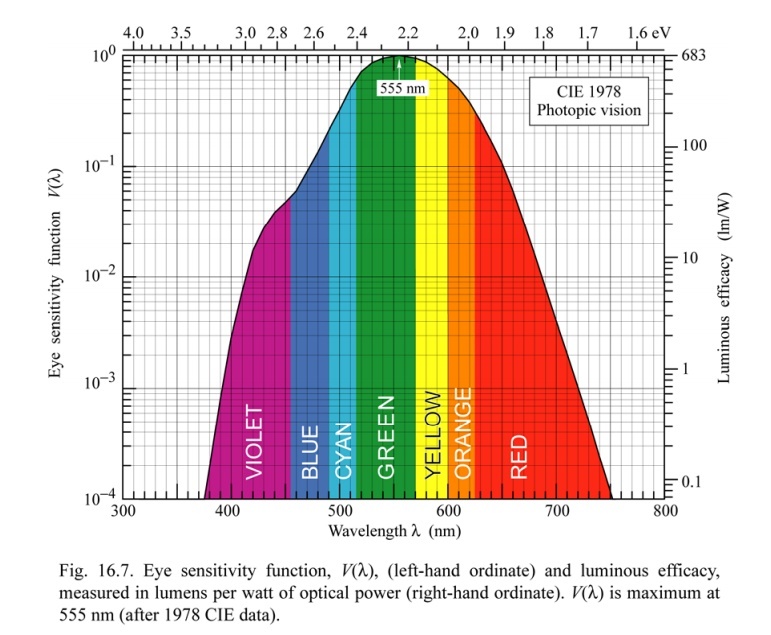 The wavelength range that the human eye observes is around 390-700 nm (according to Wikipedia). The V filter seems to cover roughly 480-620 nm. I can't comment on how uniformly sensitive the eye is, but the eye does have a much larger bandpass than the V-filter. That could account for the difference. Also, CVs are highly variable at the range of ~0.1-1 mag (depending on the particular system). Unless the measurements are exactly simultaneous then the intrinsic brightness of the CV has changed between measurements and they are no longer directly comparable. This wouldn't explain the systematic bias you found though - I was just mentioning this out of interest. Thanks for your comments! See the attached diagrams of human eye photopic response curves and std. photometric filters response. I observed TT Ari using low power with a rather large 41cm reflector, so this star appears bright enough to me (over 5 magnitudes above my low scotopic limit) to be in the low end of the photopic range of my vision (or the top end of the mesopic), so the photopic diagram is pretty close to my expected visual. Note that the peak responses and FWHM are very similar between visual and V, in this brightness regime: Vis (peak = 555nm @ 100nm), V filter (peak = 548nm @ 99nm). Yes, the human eye is somewhat broader in total bandwidth compared to the V filter, but its sensitivity at the extremes (say 400nm and 700nm) is down by several orders of magnitude, and probably insignificant, assuming TT Ari has a fairly uniform spectrum. However, IF there were some strong spectral lines near the edge of the visual response, and outside of the V filter, that certainly could make a difference! From the literature, TT Ari has a fairly strong H-beta line at 486nm, which would be more strongly apparent in the photopic visual band, than the very edge of the V filter. Not sure if its normalized flux of 1.2 is sufficient to account for a 0.2 magnitude brightness? 1.2 times brighter is 0.2 mag. 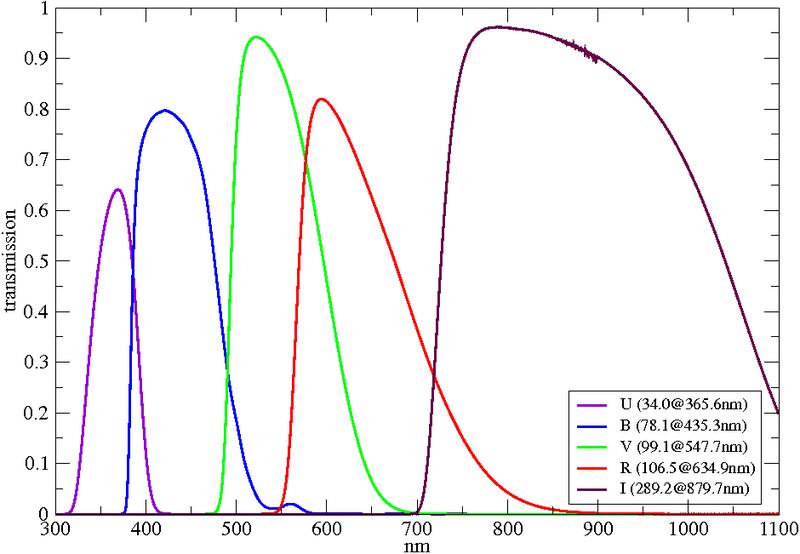 Well, H-beta is a very narrowband emission line, the peak of which is 20% above the continuum, not that the entire skirt of the visual passband is 20% higher. OTOH, 486nm is right at the edge of V filter passband, but well within the photopic response, about 20% of the maximum at 555nm. Maybe someone knowlegable about typical commercial V filter prescriptions could tell us if 486nm responds or not? But, if H-beta shows strongly in this star, I would expect H-alpha to show even more so? I haven't yet found a complete optical spectrum of this star in the literature, so not sure about this. 656nm does still respond at the 10% level in the eye, but again it appears to be very near the red cutoff end of a typical V filter. So, it is conceivable that these two major emission lines, if strong in TT Ari, may account for the extra brightness appearance visually vs. V, but need to know more precisely the full spectrum of the star, as well as the specific cutoffs of the typical V filters folks are using for this campaign. TT Ari is very blue and so is brighter at shorter wavelengths (in the wavelength range that the V-band filter blocks out). Even though the human eye is less sensitive at the band edges, I think this will play a role. The H-beta line is relatively near the peak of the scotopic response curve (507 nm) at about 80% of peak response. The V curve is much less symmetrically shaped and drops of sharply on the blue side and the H-beta line is at about 8% of peak V response, at least according the Bessel approximation of the standard curve. Peak of the V curve is at about 5300 nm and the shape is skewed to the red. In contrast, the TT Ari spectral flux density peaks shorter than 200 nm and decreases toward the red. Of the seven comp stars in a 30 min FOV, all except the 105 star are more red than TT Ari and 5 of the more red comps are much redder. The 105 star is only 0.03 mags bluer in B-V. So I would be very surprised if the CCD V magnitudes did not show TT Ari to be dimmer than visual observations. For 6 of the seven comps and probably also for the 105 star because of the strong TT Ari emission line, the comps appear relatively brighter and TT Ari relatively dimmer in V for CCD observers than for visual observers. Attached is the sequence table from VSP. Therefore, I think the slightly brighter locus of visual observations compared to CCD V observations is an expected result for this star. I can't speak for others, but as I said before, I use a fairly large aperture, so TT Ari is over 5 magnitudes above my low scotopic limit, in the low end of the photopic regime, so the latter curve is the best match for me. I suppose many observers would be in the mesopic regime, which would shift the peak response slightly to the blue. Still, my visual observations differ little from the other visual ones, on average. There may be a combination of factors at work here. Not just the strong emission lines issue, but also the comp stars for visual are not ideal. That 110 comp is too red. From Stanton's formula, we get a difference of 0.21 * (1.12 - 0.5) = 0.13 magnitudes fainter appearance of the 110 vs. the 105. This stirs up an issue I had with the "old" comp star team, where a certain individual no longer with AAVSO, was adamant to use this red 110 rather than the adjacent 111 comp with B-V=+0.69 ! TT Ari is actually very blue, much bluer than the photometry shown on the Simbad summary page. Simbad shows it as 0.53 B-V but the NOFS data in SeqPlot shows it as -0.097. B and V time series data taken during the campaign also have negative B-V values supporting the NOFS data. The NOFS color is consistent with spectral Class Be given for the star system and with the peak flux wavelength in the Belyakov, et al 2010 paper posted by Deanne. In comparison The photometry in Simbad would be consistent with spectral class F. So the star appears to be much bluer than shown in Simbad making the color difference between TT Ari and the comps much larger than in my previous post. Visual sensitivity starts shifting toward the blue by the time lux (candela/m^2) drops to 10. With a 16" aperture telescope and typical obstruction for a Newtonian, TT Ari appears about as bright through the Telescope for a visual observer as a 1.5 magnitude star appears to the fully dark adapted naked eye. It is brighter than shown at http://telescope-optics.net/eye_spectral_response.htm because you are looking at it directly rather than reflected off a white surface and I agree the eye has some color response at this light level and is in the mesopic response range. However, even if direct viewing is two orders of magnitude brighter in flux than reflected light, it will be at the very dim extreme of cone response resulting in significant shift toward the blue. That is why, in my opinion, the scotopic response curve is more applicable than the photopic. Further, since the log intensity vs. wavelength has a significant negative slope, the rod cells and blue cone receptors (peak sensitivity at 445 nm) are exposed to more intense light from TT Ari than the J-C V filter. The green receptor (535 nm peak) receives about the same intensity light and only the red cone cells (575 nm) receive less intense light. So visual observation is going to see TT Ari relatively brighter compared to the redder comps than a CCD in the V band not just because of the shift in visual sensitivity for lower intensity but also because the J-C V bandpass is skewed to the red end of the spectrum and the visual response curve is not. I can’t comment on the selection of the 110 comp in the sequence vs. the other 110 star in an F chart FOV. I don’t know what photometry was available at the time this sequence was made. The other 110 star is much closer to the edge of an F chart FOV, but it is still in the field. I can comment that the photometry in the current sequence for both the 105 and 110 stars is problematical because different bands for the same star come from different sources. The 105 comp mixes photometry data from Tycho-2, TASS and SRO. The 110 comp mixes photometry data from ASAS and SRO. Now, however, there appears to be good APASS data for all three stars. I have just posted my latest observations of TT Ari of the December 19th. Is the campaign closed or are other observations useful? The sequence team did not want to update the TT Ari sequence in the middle of the campaign. Now that it is over, however, the 110 comp has been superceded by a new, much less red comp at B-V 0.667. Please do not confuse the old and new comps since they have the same label. The old comp has been removed from the charts. The new comp uses consistent APASS photometry (Source 29). Also the old photometry from mixed sources for the 105 star has been updated tusing single source photometry from APASS (source 29). If you continue to observe this star, new charts and sequence tables are available in VSP. To avoid any possible confusion between 110 stars it is best to identify your comps using AUIDs instead of labels. Why wouldn't the sequence team call the new star 109 or 111? That would avoid confusion and its value is not used except to identify. Using the AID numbers are too long for old memories like myself. it is always better to identify comps using AUIDs rather than labels. Labels are not unique since they refer to the comp's magnitude to the nearest 10th, but AUID (AAVSO Unique ID) designations are unique.Some charts particularly ones with wide fields of view may have multiple comps with identical labels. Something that is not obvious at first when using VSP is that comp stars are not linked to specific variables. When you create a chart or sequence table it shows all the comps in the magnitude range and field of view around the variable star or coordinates you specified ragardless of the variable for which it was actually selected as a comp star. For example you may have two compstars with 110 labels, each within an F chart field of view (18.5') of the variable star for which it was chosen as a comp. If the variables are close together the two 110 might both appear in a chart with a sufficiently wide field of veiw such as C (120'), D (60') or even (particularly for faint comps) an E (30') chart. There may even be some old F charts still out there with comps having duplicate labels. So when you print a D chart to use as a finder with mag range set at 16.5 for a UG variable with magnitude range of 13.5 -19V in the Milky Way, it may show several 155 comps each within an F chart field of view of the variable for which it was chosen. While the discussion of CCD vs Vis observations is an important one, I thought I would post on the main purpose of the campaign, that is the analyze the data. Just for fun, I looked at the data for the 15 days from JD 2458090 to xxx8105. I did a phase curve with the default values in VSX/Vstar. Got a scatter plot with no intelligence. So I did some prewhitening and did a DCFFT. Got a period of .13237 days vs the default of .137xx. When I use this period, I get the plot below--Figure 1, which shows the clear periodicity. Shown in Figure 2 is the fitted polynomial to that data. It shows a fading for aabout 1/3 of the period and a brightening for the remaining period. It also shows a third and fifth harmonic behavior. What kind of pre-whitening did you do - linear, low order polynomial or something else? It would be great to see an image of figure 2 with the fundamental frequency model overlaid on it. By eye the signal looks more "triangular" than a simple sinusoid but it's hard to judge without seeing it with a sinusoidal model. Did you try subtracting the fundamental to see if you could identify any other frequencies or try modeling with this fundamental and different numbers of harmonics to see if adding harmonics gave a better fit than the fundamental by itself? Isn't DCDFT in VStar a marvelous and easy tool - and no user programming required. David Benn and all who assisted him really did a good job. I plan to talk about Prewhitening of data like this in a future talk at an AAVSO meeting. There are lots of ways to do it. As for overlaying the Phase curve and the fitted polynomial, VStar fits the polynomial, but then it subtracts the polynomial and shows those resultant residuals, which with a 5th order poly are completely flat. It does look triangular to me, which is why I used 5th order rather than 3rd. Visually the 5th did better. Going higher than 5th did not visually improve the fit. If I do a "filter from plot" of the phase curve and then fit a polynomial, it does what we want, but the filtered plot is a medium blue and it covers the fitted polynomial so that it does show up well.